Canned jackfruit is amazing. You can dry it out and put it in tacos, use it as a crab analog, put it in a salad and a bunch of other things. All you really need to do is find a can of it packed in either brine or water, break up the flaky pieces, then dry it out, braise or saute it to get the texture you want. For this application, I smothered the flaked jackfruit in a new-to-me purchase I recently found at Trader Joe’s: Sriracha and Roasted Garlic BBQ Sauce. This stuff is perfectly spicy, super thick and perfect for making pulled jackfruit sandwiches. The flavors and heat get really concentrated and thick during the bake time, making a spicy and sticky sauce that clings perfectly to the jackfruit. 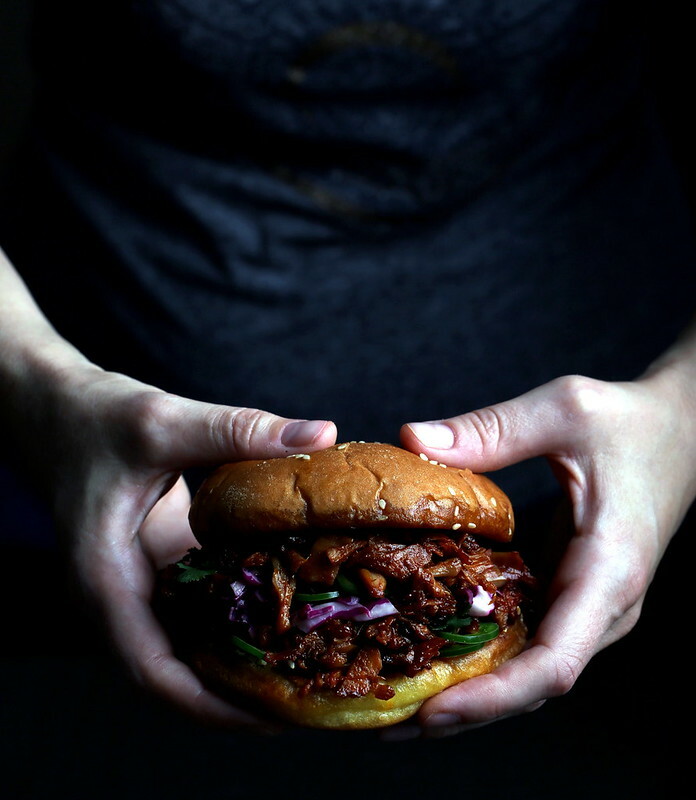 Once the jackfruit is done, the rest of the sandwich is a breeze: some red cabbage slaw is added for crunch and color, some sliced jalepeno for a different kind of heat and some cilantro for a clean and herby finish. You can of course finish it with whatever you want, but you should definitely not skimp on toasting the bun before you assemble. The buttery crunchiness is magic and worth the extra few minutes of work! Drain then pull it apart to create shredded pieces. Finely chop the tough parts and discard the seeds. Place the oil into a large cast iron pan, rub to coat, then add in the shredded jackfruit. Smother with the BBQ sauce until it covers it only halfway, stir to coat, then place into the oven for 30 minutes. After 30 minutes, remove from the oven and give it a stir. Return it to the oven and let it bake for 15 minutes more. Repeat this process until you have a texture you like. 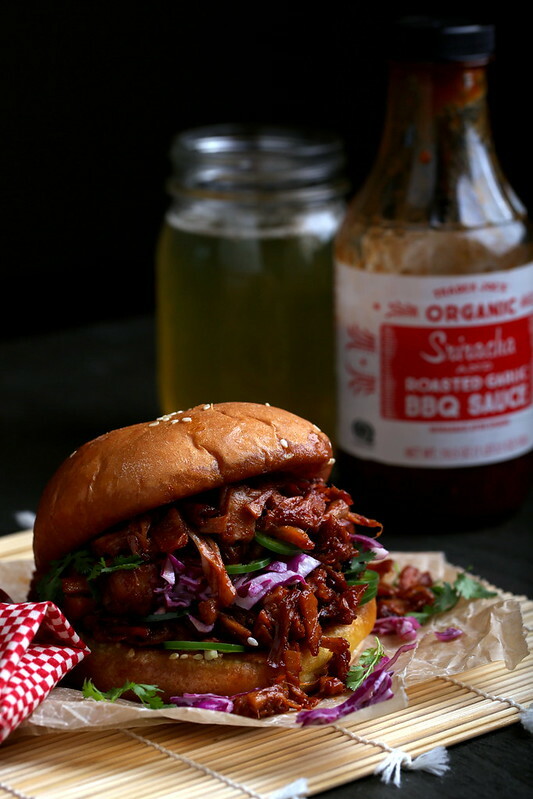 BBQ sauces vary in viscosity and sugar content, so this time will vary. I baked for an additional 45 minutes total to get this texture. Allow the jackfruit to cool and serve immediately, or chill in a separate container and serve later by warming it up over medium-low heat in a cast iron pan until heated through. First toast the hamburger buns. Don’t skip this step because it really makes the sandwiches fantastic. To toast the buns, melt enough vegan butter in a clean cast-iron pan,over medium heat so the bottom is covered. Place the buns in the pan for a few minutes, or until toasty and crisp around the edges. Repeat his process until all of your buns are golden and crispy. Quickly toss together the cabbage, vegan mayo and vinegar. 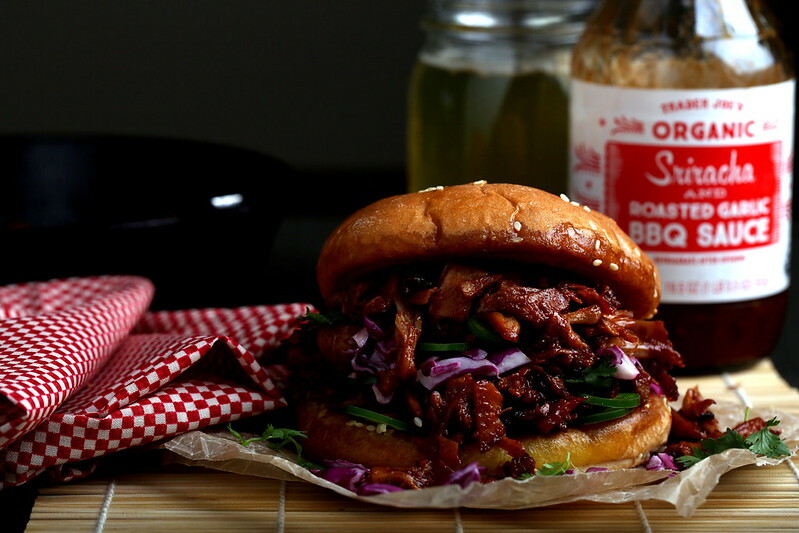 Divide the jackfruit into four portions and place them on the toasted buns. Top with the slaw, fresh jalepenos and cilantro and serve immediately. I can only find fresh jackfruit where I live. Never seen it in canned version. Any chance that the result would be the same? This works best with young canned jackfruit because it has a really soft texture. Mature jackfruit tends to be a bit tougher and fibrous, so I suspect the results wouldn't be quite the same. But if you try with successful results I'd love to know! I bought a case of NATIVE FOREST brand organic canned Jackfruit-No BPA in cans-from Amazon. Prime about $27 for 12 cans. Looks really good and my mouth is already watering. So I am going to try this really soon. Anyway, thanks for sharing. I love jackfruit, the texture is so great! I haven't tried that TJ's bbq sauce but now I'm thinking I will definitely pick some up. Thanks for the tip! great looking recipe, thanks for sharing. where do you buy your jackfruit? i have never been able to find it. It can be found in most Asian supermarkets or online. What a delicious looking recipe! 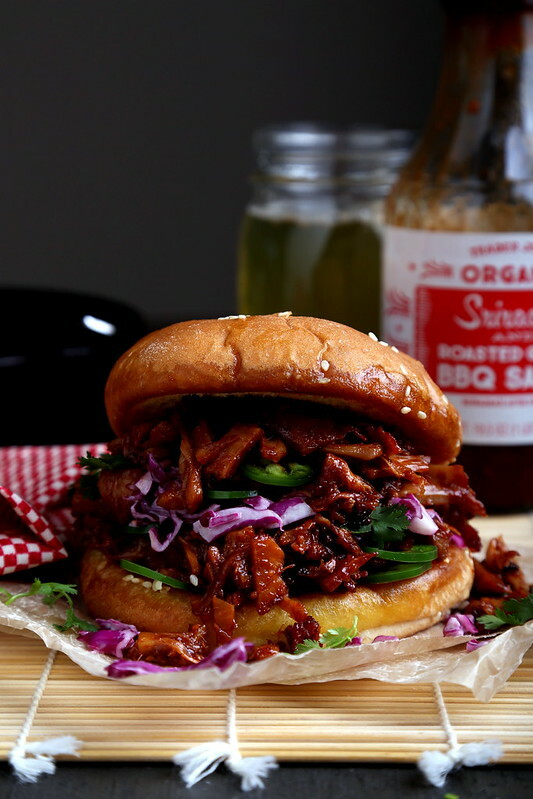 I'm always a little scared to use jackfruit..but this recipe helped! I haven't seen jackfruit cooked in the oven before. It looks like it gets the sauce really dry, in a good way. This recipe is ridiculously good. I attended two potlucks in the past week and I have never received so much attention in my life for a dish! I felt like I was a gourmet chef. Which is funny because this recipe is so easy. I cooked it just like the recipe said and wouldn't recommend any changes except I found TJ's siracha sauce a little too spicy so did half and half with TJ's basic bbq sauce. Definitely grill the buns.